Berliner Aquarium, Unter den Linden. Circa 1900. Source: Wiki Commons. On the northwest corner of Schadowstraße and the Unter den Linden, where now there stands an anonymous monolithic block, its walls punctured by repeated rows of dark rectangular apertures, yet still capable of blinding you when the summer sun bounces off their white surfaces, there once stood Berlin’s first public aquarium. I stopped by to look at this particular corner of Berlin after having encountered an old postcard from around the turn of the century, showing the old aquarium—of which no trace remained—in all its former glory. When I first saw this old postcard I reflected that, were it not for the rather feeble sign perched atop the building’s roof, advertising the presence of the aquarium within, it would have been effortlessly easy to miss the attraction altogether, for the building’s façade was not especially different from any of the other façades erected in the vicinity during the latter half of the nineteenth century; in other words, monumental, ponderous, and rather solemn. And yet, what lay within the building could be considered as one of Berlin’s great nineteenth-century spectacles. This is turn reminded me of the city’s current aquarium attraction—the Aquadom—located on Karl-Liebknecht-Straße, whose main feature—a giant cylindrical fish tank occupying the space above the reception area of the Radisson Hotel, and which is free for anyone to see—remains as equally well-hidden from passersby on the street outside. For a long time I was oblivious of this free spectacle, having walked past it unawares countless times previously, until one summer, while I was staying in Berlin, a friend tipped me off of its existence by email. On a bright afternoon a few days later, while walking from the reading rooms of the Zentral Bibliothek on Breitestraße towards the train station on Alexanderplatz, passing close by the Radisson Hotel in the process, I remembered the tip-off and, being in no particular hurry, decided to investigate for myself. I feel obliged to briefly digress here, for this change of direction, from the Rathausstraße to the Radisson Hotel, took me through the Marx-Engels Forum—another Berlin landmark that has undergone irrevocable alternation in readiness for the proposed U55 underground extension. That summer was an especially warm one, even by Berlin’s standards, and I can still recall as if yesterday, the sense of relief I felt as I passed from the harsh sunlight of the street into the cooler shade of the trees clustered in the square. I deliberately avoided the circular forum, where the sun beat down upon Marx and Engels, who were admirably tolerating the sightseers lining up to take their photographs. Instead I stuck to the Spree side of the park, looking across boats filled with hordes of tourists, towards the remains of the Palast der Republik, at that stage little more than a hole in the ground punctured by giant concrete columns, that put me in mind of Anselm Kiefer’s Jericho that I’d seen at the Royal Academy in London a year or so earlier. Anselm Kiefer, Jericho. 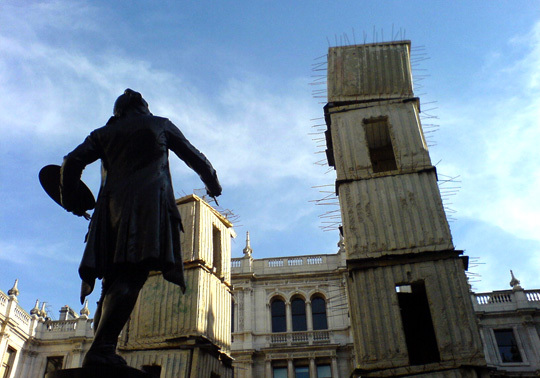 Royal Academy, London, March 2007. My respite from the harsh glare of the sun was brief, and after having negotiated the busy Karl-Liebknecht-Straße, I stood outside the Radisson Hotel. Entering the lobby, I became acutely aware of the fact that I was neither smartly dressed nor had a room reserved in the hotel, unlike most of the people around me who, by the sound of their voices, seemed to be affluent American tourists or wealthy businessmen. But when I noticed that the concierge was wholly preoccupied with the demands of his guests, and that nobody else deigned to notice me, my misgivings quickly evaporated. The entrance lobby into which I had walked was not a particularly large space—certainly, I thought, not deserving of an expensive hotel. For a start, it had a low ceiling in no way compatible with the idea of a giant fish tank. Unsure of my directions, I pushed forwards through the bustle, my eyes scanning the walls and spaces around me in search of some sign or indication of where I might find the object of my enquiries. And then, quite suddenly, the low, narrow space of the lobby opened up into a huge glass-roofed atrium, at least six storeys high, and at the centre of which stood an enormous glass cylinder of water. 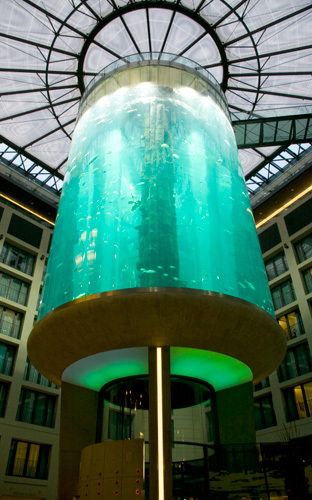 Giant fish tank, Aquadom, Berlin. December 2008. The aquarium was far bigger than I had anticipated, and I was not surprised when I later learnt that, standing twenty-five metres high, it was the largest free-standing aquarium in the world. The architects of this marvel had, quite shrewdly, mounted the tank above ground level so that its base stood some eight metres off the ground, meaning that it was perfectly invisible from the main lobby and the hotel’s entrance. One had to know it was here to find it. Inside the aquatic blue glow of the tank, I could see numerous species of fishes, most guided by the curved transparent walls in their incessantly circular peregrinations. Small silvery fish darted to and fro in small groups, amongst larger specimens decorated with vertical stripes and yellow fins, and tiny blue creatures that shimmered in the dappled natural light. Inside the cylinder there stretched, from top to bottom, a rock-like stalagmitic structure, almost tree-like in the uniformity of its shape, and which, immersed inside this watery dreamworld, reminded me of Mariele Neudecker’s vitrines that I’d seen in the Tate Gallery in Cornwall a few years earlier. I gazed up at the aquarium for several minutes, and as my eyes gradually adjusted to the scene, finding a growing number of subtleties and variations in the aquatic shapes and colours inside the tank, I slowly became aware that, at the heart of the cylinder of water, I could see motionless human silhouettes gliding up and down, for there was a lift running back and forth within the hollow centre of the tank. The collection is exhibited in a grotto-like corridor about 300 yds. in length, which occupies two floors. We first enter the Reptile House, which contains gigantic lizards and snakes of all kinds, some of the poisonous varieties attaining a length of 12 ft. The Geological Grotto, which comes next, contains birds (gulls, cockatoos) and a large seal. This is followed by the large Bird House, among the inmates of which the weaver-birds are specially worthy of notice. Here also are the cages of the apes (chimpanzees) and monkeys and, to the left and right of the entrance, tanks containing salamanders, crocodiles and tortoises. After these comes the Aquarium proper, with an excellent collection of fresh and salt water fish. We finally descend, with breeding-tanks for salmon and trout on either side, to the lower rooms, containing other curiosities of the deep and a refreshment bar. The illustrations I found complimented this written description perfectly, making more tangible to me the surreal qualities of the aquarium’s contents. They showed dimly lit cavernous spaces with artificially constructed walls, columns and ceilings of basalt, granite and other rocks extracted from German mines. Amongst their dramatic craggy shapes and rough textures snaked level walkways and regular stone steps lined with ornate iron railings, over which walked visitors in urban Victorian dress. The overall impression was quite bizarre. Inside the Berliner Aquarium. Source: Wiki Commons. Curiously, these illustrations lacked one important ingredient: the non-human occupants of the aquarium, and besides the appearance of an unconvincing reptilian creature inhabiting one particular scene, I was forced to turn back back the written accounts of the aquarium to find out more about the animal species residing in the artificial caverns. And when I did so, I read that lizards, snakes, fish of all kinds, beavers and seals, all lived in the grotto’s subtly illuminated alcoves and recesses. 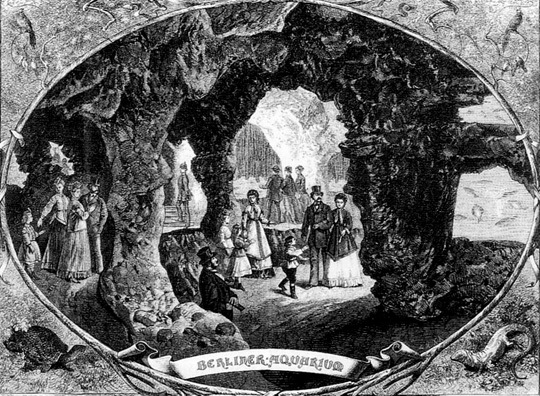 There was also a geological exhibit, a grotto in which a model of the earth’s crust was shown in cross section, with its many layers of igneous, metamorphic and sedimentary rocks. 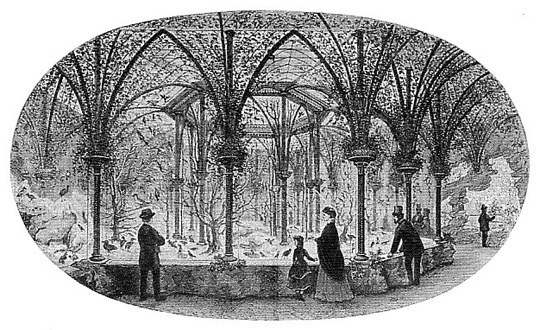 Elsewhere, on the topmost floor of the building there was an aviary—a glass-roofed winter garden—in which the aquarium’s curators kept exotic birds, and a number of chimpanzees, monkeys and other mammals housed in iron cages. Wintergarten/Aviary in the Berliner Aquarium. Source: Wiki Commons. The Berlin Aquarium was the brainchild of zoologist Alfred Brehm, best known for his series of illustrated volumes entitled Tierleben, first published between 1864 and 1869 by the German Bibliographisches Institit, This book later garnered its author worldwide recognition after its appearance in English as The Life of Animals. In the frontispiece of a reproduction volume of Tierleben, I found a portrait showing the author in his later years, sporting, besides a rather solemn and serious expression, a thick black, bushy and greying beard, close-cropped receding hair, prominent brow and substantial nose. Germany’s answer to the Darwin! Brehm was born in the small village of Unterrenthendorf in Thuringia in 1829. His father, a church minister, had a keen interest in ornithology;an interest subsequently inherited by his young son. At eighteen, Brehm had shown sufficient academic promise to be invited on a botanical expedition of Africa, organised by the eminent ornithologist Johann Wilhelm von Müller in 1847. Upon his return in 1853, Brehm took up studies in the natural sciences at the university in Jena, with notions of a future dedicated to travelling and writing about the natural sciences already well set in his mind. Though he based himself in Leipzig much of the time, he found time to visit Africa more than once, including Abyssinia, and also travelled through the Scandinavian countries, Lapland and Spain. While he dedicated much of his time to exploring and writing of his discoveries, Brehm also took an active interest in opening zoological institutions, and for much of the 1860s he held the post of director at the Zoological Gardens in Hamburg. In the late 1860s, with a reputation that preceded him, Brehm travelled to Berlin to set up a new zoological institution in the Prussian capital. At that time, Berlin already boasted zoological gardens of its own, and had done so for two decades. These gardens were situated beyond the walls of the city, out to the west and south of the neighbouring city of Charlottenburg. Brehm and his investors knew that it was senseless opening another zoo in the city, but they were aware that what Berlin lacked was an aquarium of equal prestige, and it was this that Brehm set out to establish in the heart of the city. The opening of the Berliner Aquarium was not without its difficulties, one of the most taxing being the artificial production of salt water for use in the tanks containing marine specimens. The first attempts at mimicking sea water resulted in a solution that left the contents of the tank too murky, too opaque, for prospective viewers to see what was living inside. The problem was finally resolved by the appropriately named Doctor Otto Hermes, a chemist who became Brehm’s right-hand man at the aquarium, and who took over the reigns of directorship in 1874 after Brehm’s departure. 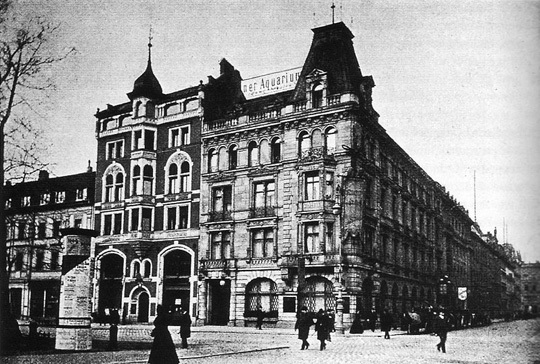 Under Hermes’ guidance, the Berliner Aquarium enjoyed many years’ success before a gradual decline set in, leading to the final closure of the aquarium on 30th September 1910. My initial assumption—that the newer aquarium located in the zoological gardens in the West End superseded the Unter den Linden attraction—turned out to be wrong, for I discovered that the zoo’s aquarium did not open until three years later, in 1913. What really did for Brehm’s creation in the end, it transpired, was the simple, blunt-edged truth of Berlin’s property market. Shortly after the turn of the century Doctor Hermes, now well into his old age, resolved to relocate the aquarium elsewhere in Berlin. Negotiations with the zoological gardens in the West End dragged on, and then Hermes passed away in the early spring of 1910. With Berlin growing ever more industrious and prosperous, the ageing attraction—without a champion to protect it—could no longer justify its prime location on the Unter den Linden, nor defend itself from the property developers and financial investors circling above. Once its animals had been rehoused in zoos elsewhere, Berlin’s first aquarium was demolished to make way for a newer, more profitable use of land, and the city lost another of its great nineteenth-century spectacles. Karl Baedeker. Berlin and its Environs. Leipzig: Karl Baedeker, 1903. Harro Strehlow. “Zoos and Aquariums of Berlin” in New Worlds, New Animals: From Menagerie to Zoological Park in the Nineteenth Century (eds. Hoage & Deiss). Baltimore: John Hopkins University Press, 1996.